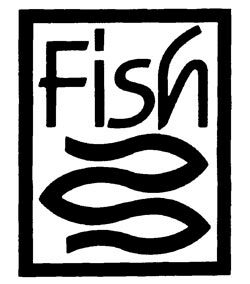 Fish Enterprises Ltd. was a UK company that produced cloisonne style enamel jewelry in the 1980's-1990's. 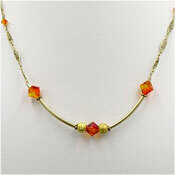 Their jewelry is often times described as cloisonne but it was not created with wires applied to a base. It was created by stamping the designs and sections onto a solid base that was then filled with enamel so it is more correct to call it stamped champleve or stamped basse taille enamel depending on the piece. Or you can just call them enameled. They called their jewelry "Fine Enamels" and sold it under several lines with packaging that read Fish Fine Enamels, Fine Enamels by Fish, Fine Enamels by Fish Enterprises or Fine Enamels by Crown Jewelry. Crown Jewelry appears to have been used for jewelry they sold to the USA but I have not fully confirmed this. Fish Enterprises Ltd. used numerous marks on their jewelry pieces. 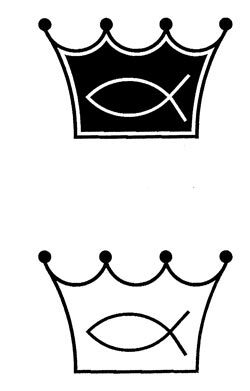 They had an all word mark of ©FISH, a mark that is commonly referred to as two fishes but it actually looks like three fishes swimming (two fish swimming forwards and one swimming backwards like an Escher drawing) and a fish inside of a crown mark. I was able to locate the trademarks for these marks and have included links to the trademark pages for your reference. Sometimes their marks included a © and sometimes it was left off or the mark only had the swimming fish. Hopefully this will help you identify some of the marks on your cloisonne style jewelry!